Asbestos is a naturally occurring mineral that has been used in a range of building materials to make them more rigid and fire resistant. It has also been used in household products like ironing boards and oven gloves. 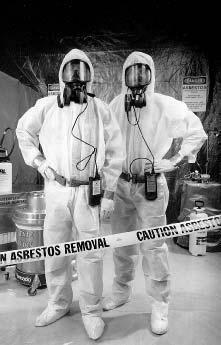 Asbestos was used extensively as a building material in Great Britain from the 1950s through to the mid 1980s. However, asbestos fibres and dust are potentially very dangerous if inhaled in higher concentrations over a period of time. If this happens, they can cause serious lung diseases including cancer. The symptoms of these diseases often don’t appear for between 20 and 30 years after exposure to asbestos. At Phil Page Skip & Plant Hire Ltd we have the right protective equipment and the tools to remove asbestos from your property. If you are concerned that you may have Asbestos in your house, office or warehouse then contact us to arrange a survey of your property and for a quotation on removing any Asbestos you may have.